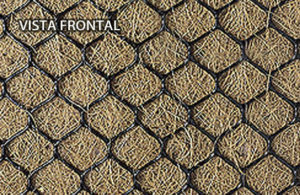 Straw fiber (P), mixed fiber – straw and coconut fiber (M) and coconut fiber (F) biotextile interlaced using a longitudinal an industrial thread with resistant polypropylene nets. 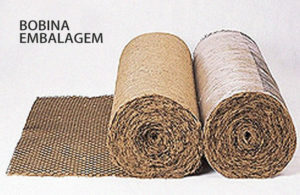 The Blanket can be unidimensional (U) or bidimensional (B) and may include a third mesh to become tridimensional (T). 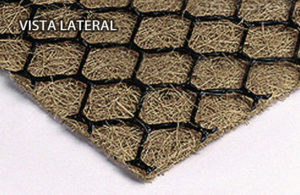 This mesh is UV-ray resistant and is mechanically strong and durable. It is coiled and packaged in a plastic film.